How smashing that something on my to-make list was already gluten-free. As I mentioned here a great deal of my fellow thespians in a Midsummer Night’s Dream(next Saturday the 7th is the last show-get your ticket and come see it!!!) are gluten-intolerant. So I made the chocolate cookie bars in a gluten-free manner and they were killed. By the actors. In the green room. With their mouths. Except for Demetrius, poor Demetrius, couldeth not been truer foul fortune for him. He eateth gluten, but is lactose-intolerantenty and thusly could not indulge in ye cookies. This recipe was already on my to-make list and already gluten-free. I had to use almond milk and vinegar instead of buttermilk but it all worked out. Normally I am a “northern” cornbread person. I prefer sweet and buttery to drier and cornier. 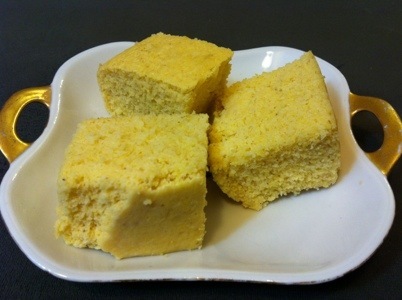 This cornbread strikes a pretty good balance. 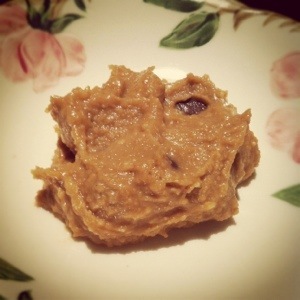 The bean purée helps maintain a slightly softer texture, but it is not terribly sweet and the corn flavor stands out. I don’t think a piece should be eaten naked(you or the bread) but t’would hold up covered in butter and honey or dunked in spicy chili. Then again, pretty much everything works well with butter. Heat your oven to 375. Spray an 8×8 pan with nonstick spray. Mix beans, milk and eggs. Mix cornmeal, baking powder, salt and sugar. Stir together. Put in your pan and bake until top is starting to brown a just a bit, 30-ish minutes. The clean toothpick test applies as well. Feed a starving actor. I did it. I purposefully made a dessert gluten-free. I have no personal reason to do this. I’ve done it not-terribly-successfully for me mum. And now I’ve done it successfully for my castmates(of the ever-fabulous hard-core A Midsummer Night’s Dream tickets here! Ok I’m done). Being diet-aware as we Los Angelenos, especially those of us in the entertainment industry are, quite a few of my castmates had discovered a lack of digestive patience with good ol’ gluten. Fortunately none of them did it in the misled belief that gluten-free food is automatically healthy. They all actually had health problems caused by wheat. But if any of them had started talking Paleo I’d have had to bite my tongue. That would hurt. Despite the gluten-free challenge, the mom in me still wanted to feed the cast of Midsummer. Acting makes us hungry. Plus, there was a bit of competition. First day of rehearsal and one of our actresses announced she baked. So of course I piped up. And then she dropped that g-free bomb and a good chunk of the cast bonded about being gluten-free so I realized if there was to be a bake-off I’d have to step up. I was loathe to go buy a bunch of flours I generally have no use for but one of the g-f’s said she’d being me some brown rice flour. I did done real good. 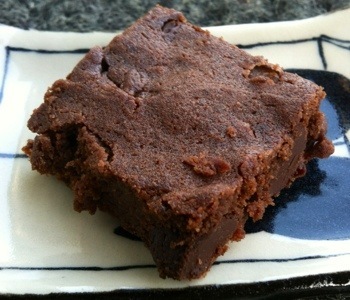 The cast loooved these bars, original recipe courtesy of Mark Bittman’s How to Cook Everything Vegetarian. All that remained from rehearsal was this sad tiny brownie which I shall now gobble. So here ya go. My would-be cookbook bf’s recipe, adapted for the g-f’s. Spray a 9×9 square baking pan. Preheat oven to 350. Use beaters to blend up the cocoa, applesauce, and butter then beat in sugar until smooth. Then ye ol’ egg. Which hopefully actually isn’t old. Blend in salt. Switch to a spoon and add remaining ingredients. Bake around 20-30 minutes. Better underbaked than over. Feed starving thespians. 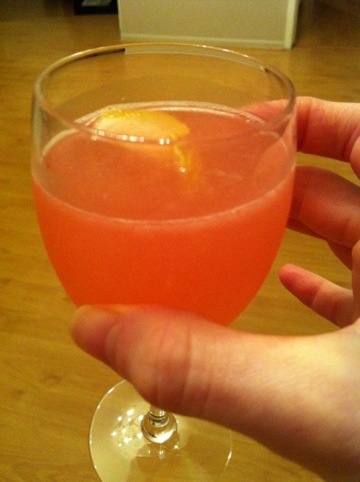 Ok, the week has finished and I have learned what makes a Cosmopolitan work. Yet my work is nevah evah done. I found that the citron vodka is so very worth it. 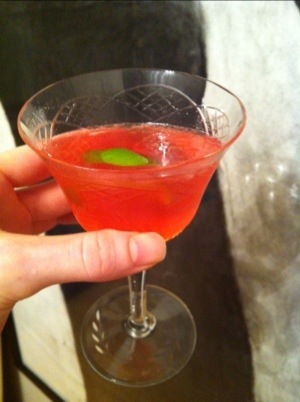 Pay the price, if an excellant Cosmo is what you desire. A bit more than half fresh lime juice to vodka works. Vodka and Cointreau in a 3:2 ratio. Provided you are using cranberry juice cocktail use equal parts of that and lime juice. And garnish with lime, not lemon. But I was not satisfied. 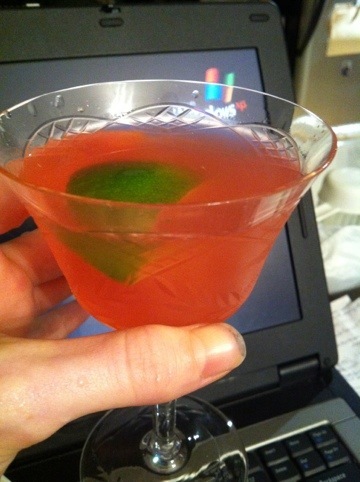 In my quest to perfect the Cosmo and give it the winning edge, I wanted to give it some brawn. Some might. The Cosmo has brains, but they are stifled by the insistance of society that Cosmos be relegated to woman. 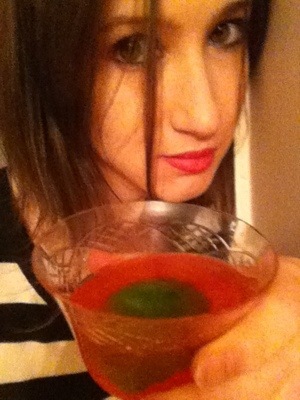 So I added in a factor with a bit of machismo: Campari. It is bitter. The stuff of Negronis. Now, it is also the stuff of not-just-a-drink-for-females. I’d call it Moen but people would expect a hot and cold dial. As a bonus I am throwing in a variation created by the lovely Alice. Make it and love it. Know that you are no longer sipping a girl drink, you are drinking a universal elixir. Shake up. Strain. Garnish. Sip. For an Mo-Alicell top off with champagne. You lose a bit of macho but gain a bit of class. Shameless plug of the day for Midsummer: we got a great review. So click on that sucker and if it sounds like a good show, get a ticket here. Thou wilt have a smashing time if thou goeth. Now on to the last of the experimental Cosmos. It stood out for it’s non-partisan blend of vodka, Cointreau and cranberry. Did this provide a perfect balance? Almost. Not quite. I have examined this recipe, sipped, scribbled and contemplated all data from this and the previous four Cosmo recipes to create an Ellen Original. The Cosmo with the Edge. Because I’m edgy. Yah. T’will be unveiled tomorrow. Shake all but the wedge and strain. Garnish with wedge. Really quite decent. But I missed that citron vodka. No entertaining videos for you today, but if you missed yesterday’s Girl Drink Drunk bit from Kids in the Hall, or Monday’s trailer for my play, well then, click those links and get giggling. No nevermind, please don’t giggle. I don’t like the word giggle. No that’s not right. The word is fine, but I would hate my laugh to be described as “giggling”, it just seems so…obnoxious. Like laughing in a bratty way. Shake all but lemon twist with ice, garnish with lemon twist. Probably the larger proportion of cranberry juice cocktail made it sweeter. Or perhaps having less Cointreau makes it less sweet since it lacks the bitter orange bite? I don’t know. I don’t think I’ve actually tasted it straight up. Hmm. Things to do.